Fans make for area stores for their gratis giveaway. 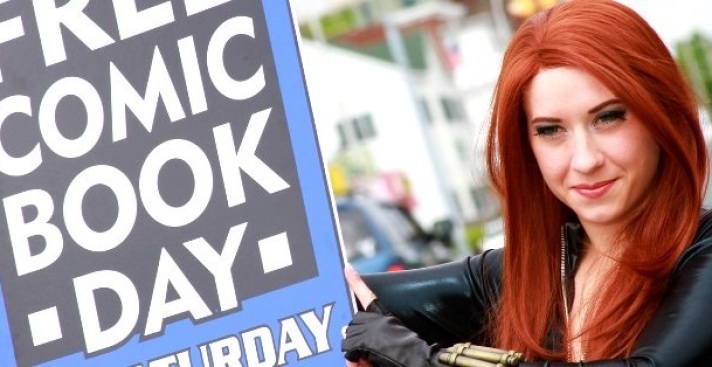 Southern California comic book shops celebrate Free Comic Book Day on Saturday, May 3. Many of us have artistic pursuits, as do our friends, and we all support each other, and we go to shows, and we visit various creative happenings, and the positivity vibes are high. But often? A friend's creativity goes rather far, and the name of his project leaves you perplexed as to what you'll find when you get to the event space. Paintings? Math? Interpretative dance? All of the above? It's charming, but nothing trumps a very, very, extremely clear label for an event, especially one that's annual and large-scale. Exhibit A? Free Comic Book Day. Can you guess what happens on Free Comic Book Day? Anyone? Anyone? You're right: Free comic books are given away on Free Comic Book Day, given away by local comics shops. Nope, not any book you grab off a store's shelf; rather, a number of special comics are set aside for gratis handing-out over the course of the convivial and always fan-packed day, which is on Saturday, May 3. And count on queues. Free Comic Book Day can feel a bit like Comic-Con on the line front, just a tad, but aren't lines at comic-lively events where the lasting friendships start? Don't make us trot out the moral to this story, because we just might. What we're saying is budget some time, hit a few shops -- Golden Apple on Melrose Avenue is always humming with activity come the first Saturday in May -- and don your cape. Need to find a shop near you? No need to fly, turn invisible, or stare through solid walls -- you can find out which comic-a-teriums are joining in the bustling mayhem.